Proteus Bikes’ Cross MY Heart and the Superbowl of Singlespeed CX took place February 1. First off, I’ve been referring to this everywhere as “Cross YOUR Heart,” so I get low marks on reading comprehension. More importantly, Proteus Bikes put on an outstanding event. Mother nature was nice enough to cooperate, as well. 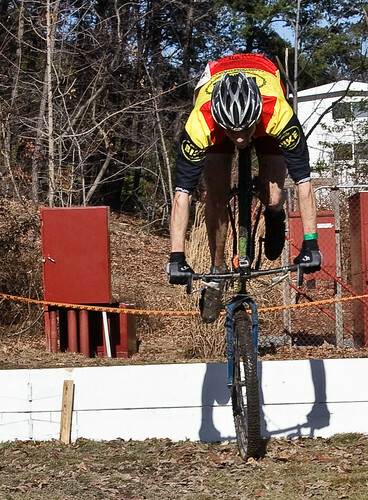 Winter cyclocross in the Mid-Atlantic is not supposed to be 63 degrees. But it made for a challenging course of ice, mud, slush and an awesome mid-winter sunshine bonanza. While I put together some interviews from the event, take a look at the photos page for a good look at the Women, Cat 4 and Single-Speed event. No pictures of the Elite or 2/3/4 race because I’m still not good enough to race and shoot pictures at the same time. A single-speed, a single barrier. What could go wrong? Bill, it was awesome to see you yesterday. Keep up the good work on the site, and it was hilarious when you and Jim were talking on the mic during the Men’s 4 race. Well, someone took some great pics and yeah, stuff can go wrong with a single-speeder and a single barrier–ouch! I don’t know too much about the ‘cross culture, so I was wondering if the mountainbikers catch any grief from those racing more traditional “road” bikes with drops? Not to get too kumbayaish, but the culture of cyclocross is one of inclusion. We want everyone to show up and to race. MTB? absolutely, Road bike, unicycle? Why not, been there, seen that. The one cardinal rule for mountain bikes on the course is to leave the bar-ends at home. They are illegal in cross and could leave a pretty severe mark in a crash. And if you wear a camelbak, you probably will get heckled but it’s only because we love you.